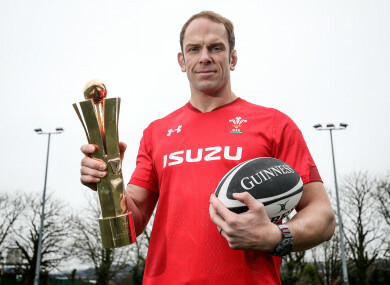 Alun Wyn Jones shows off his award after being selected as the top performer in the 2019 Six Nations. ALUN WYN JONES has capped another Grand Slam-winning campaign with Wales by picking up the Six Nations Player of the Championship award. Jones had an outstanding tournament for a Welsh side who completed a clean sweep of victories by overcoming Ireland last weekend in Cardiff. The 33-year-old Ospreys lock, who’s now a three-time Grand Slam winner, saw off competition from team-mates Hadleigh Parkes, Josh Adams and Liam Williams, as well as England duo Jonny May and Tom Curry, to take the award which was won by Ireland’s Jacob Stockdale last year. Jones came out on top in a public vote after the six nominees had been selected by a panel of rugby writers and broadcasters from across the six participating countries. “I’m very flattered to be named the Guinness Six Nations Player of the Championship. For me as the captain, it’s a validation of what we’ve done as a squad throughout the campaign,” he said. The bronze award presented to Jones was created by Irish sculptor Jarlath Daly. Email “Wales captain Alun Wyn Jones named Six Nations Player of the Championship”. Feedback on “Wales captain Alun Wyn Jones named Six Nations Player of the Championship”.